The historic meeting between South Korean President Moon Jae-in and North Korean leader Kim Jong-un has raised hopes for a lasting resolution to the inter-Korean standoff. But American human rights activist Suzanne Scholte urged for caution, saying that the nuclear issue and human rights should not be separated. She added that the South Korean government seems to care the least about the abuse of human rights in North Korea -- when it should care the most. “I feel like it is the exact same play book that has been used by the previous regimes in North Korea, manipulating South Koreans. We saw this happen since the late 1990s,” Scholte, the chairwoman of the US-based Defense Forum Foundation and North Korean Freedom Coalition, said in an interview with The Korea Herald on Wednesday. Scholte, who has been working for North Korean human rights for decades, came to Seoul to host the 15th North Korean Freedom Week from April 28 to May 5. The annual event was started in 2004 to demand that the US pass the North Korean human rights Act. “We have to be cautious before we get all euphoric. Kim wants us to think it is a big breakthrough, without the intention to follow any of the commitments. The last thing we should be doing is to bail out the regime, like we did in the era of Sunshine Policy,” she said. The Sunshine Policy was the Kim Dae-jung administration’s policy of engaging and increasing cooperation with North Korea. “I am in great support for humanitarian aid, but it is crucial that delivery is monitored to the point of consumption, to see that it reaches the intended recipient,” said Scholte, who supports the campaign of delivering USBs and other sources of information to the North. “North Korea under Kim Jong-un’s regime has changed from the past. The North Koreans are the ones taking the risks to absorb the information, and they are anxious to hear about the outside world,” she explained, adding that this was why the theme of North Korean Freedom Week was the “truth will set them free” this year. Scholte, who first brought North Korean defectors to speak before the US Congress in Washington in 1997 about the brutal suppression of human rights in North Korea, says that the nuclear issue and human rights are closely related to each other. “It is precisely because North Koreans are denied the basic human rights that the regime is able to develop weapons of mass destruction,” she said, explaining that previous US administrations had prioritized ending North Korea’s nuclear program over human rights. When there is no dispute that crimes against humanity are being committed, it is wrong for the international society to neglect a regime that continues to “mass murder” its own people, just because North Korea says it will give up its nuclear weapons, Scholte added. She also requested that Moon address the human rights issue in North Korea, saying it is key to a peaceful resolution of conflict. “He was a human rights lawyer, and his family came from North Korea. And he is the person who could have the most influence in helping the people there,” she said. “Late professor Hwang Jang-yob said (the) human rights issue is the Achilles’ heel of the Kim regime. I want to tell Moon, do not adjust your policies to help Kim Jong-un, have the policies that would help the people in the North.” Hwang was a former secretary for the North Korean ruling Workers’ Party who had defected to the South in 1997. At the very least, Seoul should ask Pyongyang for the release of all political prisoners and abductees there, and to allow the International Red Cross to have access to these political prisons, she added. Regarding the expected summit between US President Donald Trump and North Korean leader Kim, Scholte raised concerns that it might create “terrifying optics” that would only embolden Kim’s regime. 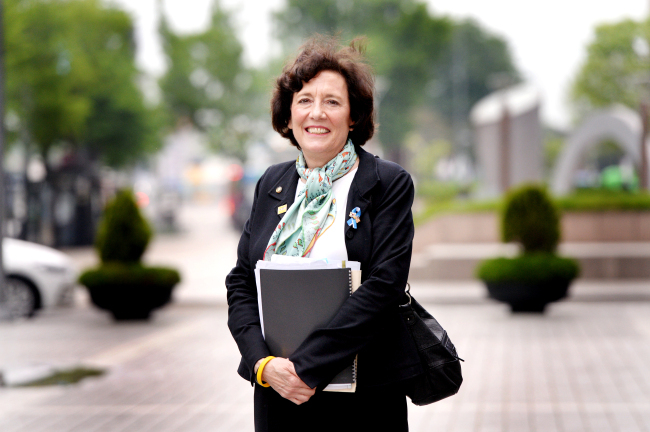 Scholte’s decades of working for human rights in North Korea started in the 1990s, when she became the president of the Defense Forum Foundation, a US nonprofit group that promotes national defense and values such as freedom, democracy and human rights. “I first thought I should give a voice to the people who live under dictatorship. So I started hosting defectors from the Soviet Union, Cuba and China to talk about what made them turn against their regimes,” she said. She also became interested in North Korea. In 1996, she reached out to the South Korean Embassy to ask for help in contacting North Korean defectors. The following year, former Col. Choi Joo-hwal and the late high-ranking official Ko Young-hwan spoke out publicly for the first time about the atrocities happening under North Korea’s dictatorship, in front of the US Congress in Washington. She also contributed to the passage of the US North Korean Human Rights Act in 2004. In addition, she created the North Korean Freedom Coalition with a defectors group in the South. Her foundation has hosted hundreds of visits of defectors, from the late professor Hang Jang-yop to survivors of North Korean’s political camps and victims of trafficking, as well as abductees and war prisoners from the 1950-53 Korean War. In the beginning, she had trouble sleeping, as she would have nightmares from hearing the horrible stories from the North. But it was God that made her stay, she said. Working with defector groups for years, she explained that it is important to understand that the defectors do not hate North Korea. “They love their homeland, but it is just that they left the dictator. Also, most defectors have family members still alive in the North. And they are under enormous stress, and they also have terrible guilt that their loved ones might be put in danger because they sought a better life,” she said.